Laravel Envoy provides you a simple and elegant way to run common tasks on your remote servers. If you have ever used Fabric, Capistrano or other tools for managing remote tasks, you already have an idea how Envoy tasks will look like. Note: Laravel Envoy requires PHP version 5.4 or greater, and only runs on Mac and GNU/Linux operating systems. Note: Envoy is not Laravel dependent, which means you can use it on any PHP project you want. echo "Starting deployment on s <$1> environment"
echo " Please specify on what environment you want to deploy: "
As you can see, it’s pretty straight forward. Of course, you can create much more complex deployment tasks, it’s entirely up to you. Feel free to share your knowledge and experience with Laravel Envoy, or share your best practices when dealing with remote tasks. I’m curious about the purpose of the SSH agent items you’re doing in the deploy function of your bash script? without that I had problem pulling the repository and that key is used only for that git repo. I had limited access to the client server and this is the (only!) way that I found to work. Whatever else I tried I got the error that ssh agent is not running. I see you have much more experience, any suggestion? That’s interesting! I’m not sure what might have caused that unfortunately. Based on what I can google about it, it *might* be something to do with your setup (where you are deploying to) specifically. Ssh-agent is a way to store/cache ssh keys so you don’t need to re-enter a ssh key password every time you use it. 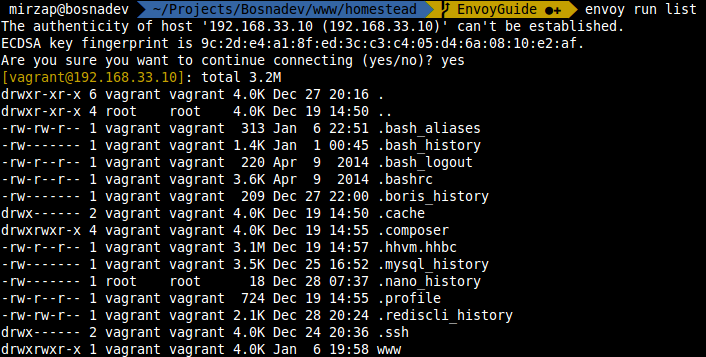 when I run the command “envoy run MyTaskName” nothing happens!! I’m intersted in programicly push ip’s into @server variable. Is there any way ? Me too. I haven’t tested this code, but it should work. Really cool service. I wonder how it works with servers where you don’t keep sshkeys, but auth using username and password. Is this achievable?